The examination is performed using automated robotic ultrasound instrumentation to scan the whole breast volume, allows automatic scanning of the breasts and computer reconstruction of the breast volume – Sarel Company has taken part in the procurement of advanced instrumentation. Good news for women from Hillel Yaffe Medical Center in Hadera: a unit for breast imaging has recently opened at the medical center’s imaging Institute. The unit provides a capability that complements such diagnostic and treatment facilities currently operating at the medical center as breast MRI, oncology unit, breast surgery and more. 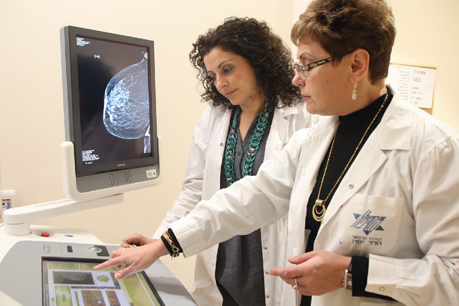 The unit has the most advanced equipment, including mammography with tomosynthesis, biopsies guided by tomosynthesis and a robotic ultrasound instrument for scanning the whole breast volume – the only of its kind in Israel. The mammography instrument acquired by the institute is one of the most advanced in the country. The device’s technology improves the breast cancer diagnostics due to the use of the tomosynthesis method – a new technology that is particularly suitable for women whose breast has a thick texture (more glandular tissue than adipose tissue). This is especially typical in young women, but also in some women receiving menopausal hormone therapy. The examination is performed using robotic automated ultrasound to scan the whole breast volume, allowing automatic scanning of the breasts and computer reconstruction of the breast volume. The institute’s equipment has been purchased thanks to the generous contribution from the Dotan family through the Reut charity. This contribution will undoubtedly help to continue providing the most quality and advanced medical care to patients and is of a very important significance for the institute’s future and current patients. Sarel was very pleased to participate in the process of procuring the most advanced instrument for the breast imaging unit and to assist Dr. Amnon Ben Moshe, the administrative manager, and the hospital staff in the process of procurement. For more information please contact Ben Eliyahu, manager of Instrumentation Department, at 054-6722092.